Apple posted the notice on its developer site this week, and said that trying to manipulate the rankings, or using services that promise or guarantee such a result, could end up with Cupertino revoking the offender’s developer program membership. With more than 500,000 apps in the App Store, getting one’s app to stand out from the crowd has become more and more of an imperative for developers of both paid and free apps. Some proponents might argue that the cream naturally rises to the top, but that’s not always the case when dealing with such an enormous volume of competition. As such, Apple’s rankings are seen as one of the best—and one of the most democratic—places to get your app out in front of customers. 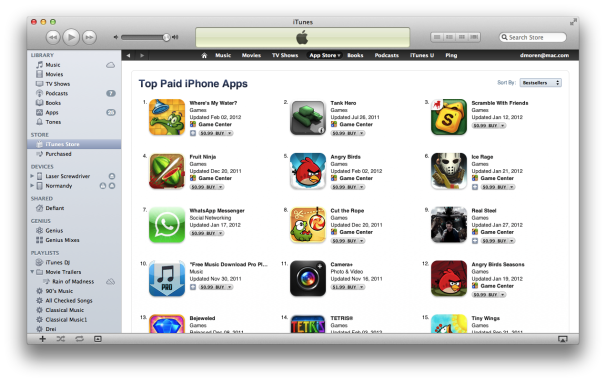 Climbing the charts: Apple's Top Paid and Top Free charts are seen as some of the best publicity around. And that’s precisely where companies such as ComboApp and GTekna come in: These firms offer promotional services for developers looking to publicize their apps. In some cases, the companies even guarantee that their promotions will help developers get on Apple’s charts. ComboApp offers a variety of promotional services, including positive independent reviews and guaranteed placement in “at least one of Apple’s Top 100 categories.” Should the company fail to do so, it returns half of the $4900 cost of the service. ComboApp also says that if it decides it’s not possible to help a specific app, it will refund the entire fee. ComboApp chief operating officer Julia Guzunova told Macworld in an email that the company has “never used unethical services on behalf of any of our clients, and we will never do so in the future.” Instead, she said, the firm focuses on social networking, buzz marketing, and advertising, an approach it says work well and, most importantly, is sustainable. In terms of Apple’s warning, Guzunova says that ComboApp embraces Cupertino’s decision, and even sees it as an opportunity for the service to distinguish itself from what it calls “black hat marketing agencies” that utilize illegitimate means to accomplish the chart placement. “We couldn’t compete with their offers because their fraud-based promotion methods simply gave them an unfair advantage in the market place.” According to her, ComboApp plans to make no changes or updates to the way it does business as a result of Apple’s warning. GTekna, on the other hand, is aimed at promoting free apps. While the company had previously offered a money-back guarantee to place an app in the App Store’s Top 25 Free Apps chart, GTekna co-founder and CEO Chang-Min Pak told Macworld via email that the company had recently removed the guarantee to comply with Apple’s stated guidelines. “Since Apple clearly mentioned that using a promotion service that guarantees a certain ranking is not allowed, we stopped providing a guaranteed ranking service. However, we continue providing our promotion service,” said Pak. Furthermore, Pak said GTekna relies on banner ads on websites for its promotion, and doesn’t use bots (automatic purchasing agents) to generate downloads, as he suspected other services do. Like Google’s PageRank algorithm for search results, Apple’s system for its charts is a closely guarded secret—nobody knows exactly how the company generates the lists, other than that sales volume obviously plays a part. Some have speculated that a weighted average of recent sales might be involved, and that revenue is valued over units sold. But it’s apparent that some firms have managed to get a handle on at least part of the ranking scheme, because apps that otherwise probably wouldn’t crack the top 100,000 have made their way into the top 100—and even higher. Temple of doom: The $1 Temple Jump made its way to the top paid spot despite poor ratings. Recently, a $1 game named Temple Jump—a copycat of the popular game Temple Run—made its way to the number one spot on the App Store’s paid list. It, and 58 other games by developer Anton Sinelnikov, were removed from the App Store last week. 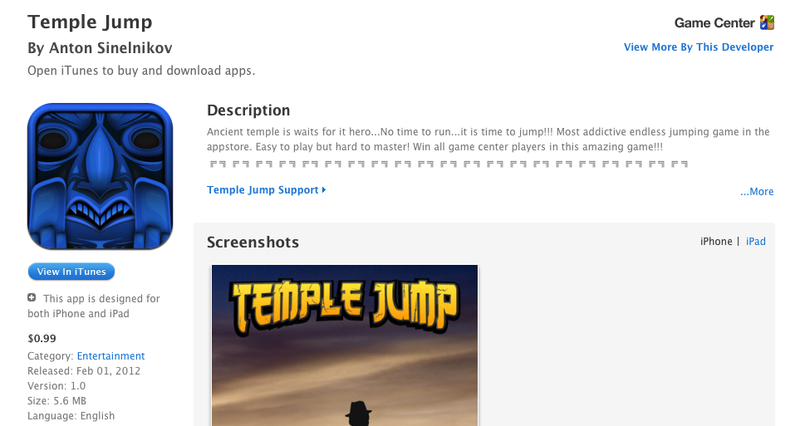 But Temple Jump’s ascent to the top spot was likely one of the factors that prompted Apple’s missive to developers. While marketing, PR, and word-of-mouth can legitimately play a big part in app sales, it’s also likely that at least some of these apps have been gaming the rankings by using automated systems such as bots to rack up purchases, or by illicit schemes like the infamous Towson Hack. For many developers, Apple’s warning, and the fact that it appears to be cracking down on apps that take advantage of these means, is definitely a positive. For one thing, it helps level the playing field for those trying not just to make a hit, but a living developing software. App Cubby founder David Barnard concurs. “For those of use working hard and playing by the rules, it’s disheartening to see scammers making so much money in the App Store,” he wrote in an email. By most accounts, Temple Jump was a slapdash attempt to copy a hit game and make a lot of money quickly. The game’s App Store page, before its removal, featured just a single image, of the game’s splash screen, and was laden with one-star reviews, most of them complaining that the game was buggy and broken. 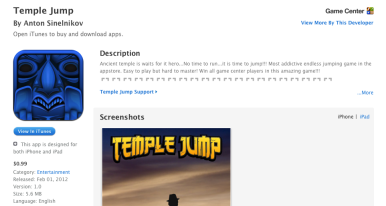 In fact, with more than 400 reviews, Temple Jump had a rating of just one-and-a-half stars. And yet, it rocketed up the charts, in part because success in the App Store begets success—customers have become trained to believe that placement on the charts implies a certain degree of quality. But when they buy an app and come out feeling disappointed, or worse, cheated, it can have a deleterious effect on the entire ecosystem. While an Apple spokesperson would confirm that the company removed the apps in question, he declined to comment further on the issue. Though many developers are happy to see apps like Temple Jump disappear, they also acknowledge that they’re playing a different sort of game altogether: They’re not in it to make a hit single, but to have a lengthy career.